Air Emission Compliance for Wood Pellet Manufacturing | Nestec, Inc.
Across the U.S. Southern region, industrial-scale wood pellet manufacturing facilities are converting trees into wood pellets and shipping them to Europe and the Pacific Rim to be burned to produce electricity. The industry has grown almost 10-fold since the early 2000’s, converting millions of tons of trees into wood pellet fuel for power plants. 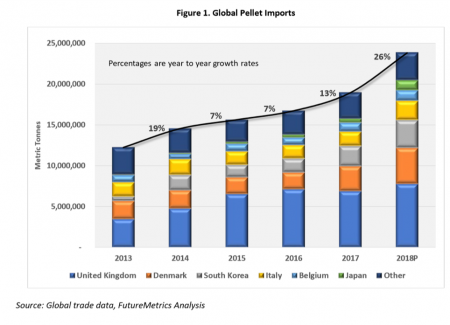 The demand for economical and sustainable fuel sources like wood pellets continues to grow. As in many other industries, air emission control is required to prevent VOCs (Volatile Organic Compounds) and HAPs (Hazardous Air Pollutants) that are emitted in the pellet manufacturing process from entering the atmosphere unabated. Compliance requirements typically come into play for facilities that are producing more than 200-250,000 metric tons per year (mpty) of pellets. 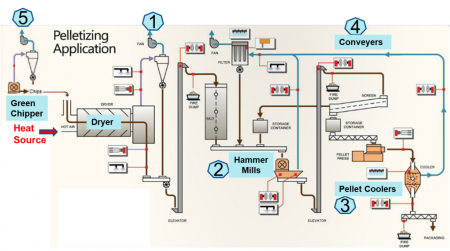 Initially, air emission compliance focuses on the plant’s dryer exhaust, which requires a particulate control device prior to the Regenerative Thermal Oxidizer (RTO) if fly ash is generated from the dryer heat source. Softwoods like pine generate a much higher level of VOCs than hardwoods. However, hardwood pellets release more HAPs and therefore can result in non-compliance with the EPA’s Maximum Achievable Control Technology (MACT) standards that limit the emission of ten tons per year for an individual hazardous air pollutant and 25 tons per year for all HAPs combined. NESTEC has developed a proprietary air emission control system for the wood pellet industry with Particulate Matter (PM), VOC, and HAP control that covers all sources or just individual sources, as needed. Numerous systems have been installed by NESTEC that meet or exceed all current compliance standards. Furthermore, these units are engineered to operate with little or no additional fuel requirements. An energy feedback loop that enables a 70% flow turn down when mills and coolers are shut off. At all times the system maintains duct velocities to help prevent condensable and particulate drop out in the ducts, as well as allow for a mist fire suppression system instead of a water spray deluge, which can cause a flooded duct condition. If you have an application that requires air emission compliance and would benefit from conservation technologies that will substantially reduce your energy bill, contact NESTEC today for a free process analysis.